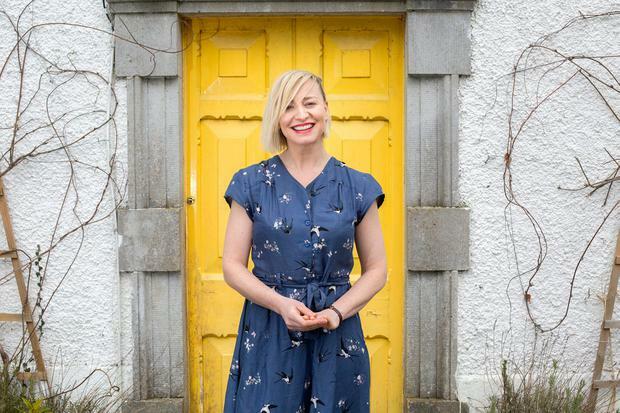 Cathy Davey is in the 19th-century Unitarian Church on Dublin's St Stephen's Green, ready to record her debut live album - but the circumstances are far from ideal. She is smothered with a cold and a succession of hot drinks and lozenges are on hand to help get her through it. After something of a shaky start, she hits her stride - and, sick or not, she offers a reminder of what a special talent she is when the mood takes her. And the sold-out crowd seem to love it. The live album, appropriately named Bare Bones in deference to the stripped back performance featuring a handful of musicians, will only be released on vinyl and will be available on Record Store Day next month. A couple of days earlier, Review meets Davey at the fine old farmhouse in Co Kildare that she shares with her partner, Neil Hannon of the Divine Comedy. She's been to the doctor that morning and hopes that antibiotics will help her put an end to the illness she's had since Storm Emma's arrival. But she's in ­unfailingly good form, especially when she's showing off the assortment of rescue animals that are housed in the adjoining fields and outhouses. Since 2011, Davey and like-minded animal lovers have been running the My Lovely Horse Rescue charity - named, in honour of Hannon's ditty, famed for its use on Father Ted. Today, there are more pigs than horses on immediate view and they're a sociable bunch as they follow Davey around like she's Little Bo Peep. Four rescue dogs of various breeds join us in one of the front parlours and doze off as our conversation begins. It all looks idyllic but Davey points out there's plenty of hard work to do, no matter what day of the week it is. "This is the first time I've worn a dress in ages," she adds. "I'm usually in tracksuit bottoms and attire a bit more suitable for being out and about." But one senses that Davey derives contentment from a life less frantic. "I love being surrounded by all these animals and, of course, I'm thankful for those moments when I can focus on the music." She admits that months can go by without her working on any new material, but she doesn't seem unduly concerned about that. As someone who signed to EMI in her mid-20s and experienced the usual record-tour-record demands before she was dropped after her second album, Tales of Silversleeve, failed to sell as well as the record company had expected, she seems content to be able to pursue music at her own pace. Hannon, by contrast, is a productive soul and his next album - which Davey says will be a double album on which she played the drums on certain tracks - will be his 12th. A second front parlour serves as a makeshift studio and rehearsal room - it's full of instruments, set up to be played at any given moment. The pair tend to pursue their own creative endeavours and Davey says she has huge admiration for Hannon's work. "He's at a different level to me," she says, kindly. "There are certain songs of his that when I listen to them, I'm just in awe." But her own oeuvre - numbering four albums from 2004's Something Ilk to 2016's New Forest - is an impressive body of work and one deserving of rediscovery. The latter album, in particular, offers a good sense of where Davey is right now - it's essentially a paean to nature and to a life rooted in the here and now. In its own subtle and beguiling way, it encourages the listener to stop rushing about and to take stock of the magnificence of the natural world on their doorstep. Her life now could hardly be more different to the one she had in her native Dublin: outside, in the front garden, there's the constant cawing of the rooks who live in the tall trees - it's a sound she loves, although she admits that there are aspects she misses about living in a city, not least being able to buy quality bread. "I'd love if it if we could be more connected to nature and to animals," she says. "There's something restorative for the soul to be in the company of these guys" - her hand sweeps the room to take in the sleeping dogs - "and it makes me sad when you take them for a walk and if they go up to say hello to children and you have these protective parents who keep them away and sort of glare at you for having the dogs." Davey was born into a family steeped in the arts. Her father, Shaun Davey, is an acclaimed composer, admired for such albums as The Brendan Voyage, which featured the uilleann pipe maestro Liam Óg Ó Flynn, who died earlier this month - "Liam was a big part of our lives when I was growing up," she says. Her mother, Agnes Conway, is a distinguished sculptor, and both Davey and Hannon composed a piece of music to accompany one of her recent exhibitions. "A bohemian upbringing isn't always as rosy as you might believe," she says, "but what it does is to normalise the idea of being creative." She is just as interested in visual arts as she is in making music. There are shelves of records in the room we are in - "their mostly Neil's" - and Davey likes the single-mindedness of only releasing Bare Bones on vinyl. "It's an antidote to streaming, isn't it? One of the things I most like about it is the fact that you go to the trouble of putting a record on and you tend to listen to it from start to finish and the songs that mightn't have appealed on first listen could be your favourites six or seven listens in. "You don't get that with streaming - not when it comes to albums, anyway. And it's a pity that that's been lost." Bare Bones will be a stop-gap until the next album - whenever that might be. Davey is no longer on the treadmill common to so many musicians and she says there are a number of projects she's thinking about but one senses any new material will not be rushed. And besides, there's the more pressing work of ensuring that the rescue animals have enough 'haylage' - a hay and silage hybrid - to tide them over until spring gets going properly and there's enough grass for them to munch. It's a life uncommon to many musicians but for Davey, who turns 40 later this year, she wouldn't have it any other way.